Genre & Setting: It’s what Shakespeare people like to call a “problem comedy,” which seems to be code for “a bit of a mess, really.” There are comic bits, and tragic bits, and lots of bits with people standing around making long speeches, and none of it hangs together very well. The setting is, to my considerable astonishment, the Trojan War -- last seen in these pages a year ago, in the Illiad. This production doesn’t exactly escape the soap opera production values of the BBC adaptations, and the spare couple of archways that represent Troy are a bit weak, but the encampment of the Greeks is a veritable masterpiece of evocative setting compared to what else we’ve seen lately. The Gist: Troilus and Cressida follows the plotline of the Iliad, more or less, which means you’ve got the Agamemnon and Nestor and Odyssius making long speeches about how to get Achilles out of the tent he shares so comfortably with Patroclus and back where he ought to be, viz. slaying Trojans. You’ve got the Trojan court, where pretty much everybody thinks that the smart thing to do would be to hand ol’ Helen back to Menelaus with an apology, but they end up continuing the war for the sake of simpering Paris, who doesn’t want to give Helen up. Into this familiar scenario, Shakespeare drops a story from Chaucer about a guy named Troilus and his faithless lover Cressida. 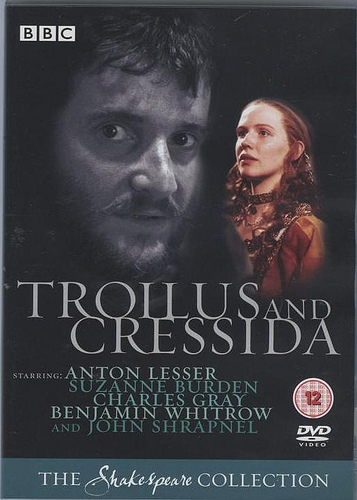 When the play begins, Troilus -- who for Shakespeare’s purposes has been inserted into the Trojan royal family as a brother of Hector and Paris -- has it bad for Cressida, and begs her uncle to help him woo her. The uncle, liking the idea of a royal connection, pours it on thick, but Cressida seems totally uninterested. Then, at some point, she suddenly seems extremely interested, and the uncle hustles the two young folks into a spare bedroom to do some informal weddin’. But alas, even as this private, um, ceremony is taking place, an agreement is made to exchange Cressida for a Trojan POW. Copious tears ensue, and a highly lengthy exchange of vows of constancy. Then, some time later -- it’s not clear how long -- Troilus joins Hector as a guest for a feast in the Greek camp. For no apparent reason, Odysseus takes Troilus aside so he can watch from hiding as Cressida tells another guy that no, she won’t be his girlfriend; no, she won’t be his girlfriend; oh, what the hell, sure, she’ll be his girlfriend. We in the audience are wondering what she’s up to, but we’ll never know because this is the last we’ll see of her. Troilus, meanwhile, is noticeably upset, and takes out his frustration by killing scads of Greeks in the penultimate scene, a big battle number. The Adaptation: Another BBC production with very competent stage actors and utterly uninspired filming. Clocks In At: More than three hours, dude. Pros: The guy playing Hector has terrific physical presence, and seems to have a stronger sense of how to play for a camera than the rest of the cast. Cons: Two major characters, the uncle and a slave in the Trojan camp, are played as broad caricatures of stereotypical gay men. Why? Also, this is the first of the BBCs we’ve seen with a big clash-of-armies scene at the climax, and, well, it ain’t exactly Saving Private Ryan. Prognosis: Troilus and Cressida gets very little respect, and a telling measure of this is its tiny little Wiki page, which asserts that it “faithfully follow[s] the plotline of the Iliad.” I’m sure that pretty much everyone in the great Shakespeare industry has to have noticed that T&C actually follows the plotline of the Iliad with what you might call wacky spontaneity, but none of them have bothered to clarify the point on the world’s current de facto repository of go-to knowledge. Interesting. To be fair, this play is only of interest to a non-scholarly audience, if at all, because it has the imprimatur of the Shakespeare brand. I’m skeptical that a good production that stayed faithful to the script is even possible. It’s a problem comedy, all right.